Outdoor air pollution ranked fourth both in mortality and in the overall burden on health rates in China, where it contributed to 1.2 million deaths and 25 million healthy years of life lost in 2010, according to the 2010 Global Burden of Disease (GBD) report, presented at an international Workshop in Beijing on March 31. The report found that outdoor air pollution in the form of fine particles is a much more significant public health risk than previously known or assumed − contributing to an annual 3.2 million premature deaths worldwide and 76 million years of healthy life lost. Organized by Heath Effects Institute and Tsinghua University and sponsored by The Energy Foundation, the workshop invited dozens of experts to discuss the health impact of air pollution globally and in China specifically, aiming to trigger both the government's and public's attention to air quality treatment. 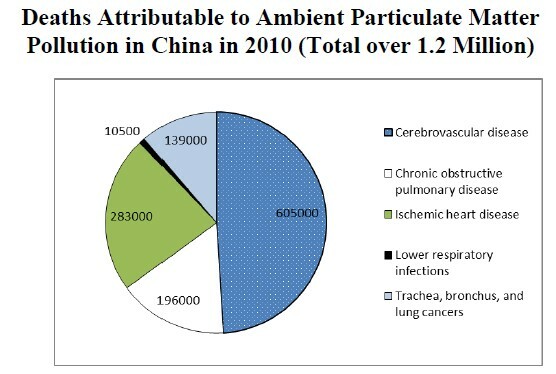 "The burden of disease attributable to ambient air pollution in China increased by 33 percent from 1990 to 2010 due to increased PM2.5 levels and increased rates of death from stroke and heart disease," said Dr. Aaron Cohen, principal epidemiologist with the Health Effects Institute and co-chair of the GBD Ambient Air Pollution Expert Group. "Air pollution is an increasingly important cause of lung cancer in developing Asia, contributing to about 20 percent of lung cancer cases in China in 2010," he added. Professor Bai Zhipeng from the Chinese Research Academy of Environmental Sciences believed the health benefits from air quality improvement will influence GDP growth. "It is essential to analyze the data on environment and health and calculate the positive and negative impacts on GDP through scientific methods, which will be helpful in the decision-making regarding the shut-down of heavily-polluting firms, the installment of pollutant limit controls and health protection," he said. Outdoor air pollution ranked fourth both in mortality and in the overall burden on health rates in China, where it contributed to 1.2 million deaths in 2010 alone.